Palaces are, in their own way, places of contemplation, focused on power. They are functional buildings of the rich, and show to the ‘ordinary’ people what money can do. The aspect of wealth expressed in stone – which is the essence of palaces – is a quadralectic-psychological story, which runs from a Second Quadrant (II) idea, made visible in a Third Quadrant (III) environment and glorified in the abundance of the Fourth Quadrant. The institution of a palace is probably as old as rulers could motivate people to contribute to their glory. The Palace of Minos in Knossos (Crete) is one of the earlier examples of an extended palace complex. The date of construction was in the fifteenth century BC, putting it in the same time span as the Eighteenth Dynasty (1558 – 1303) in Egypt. 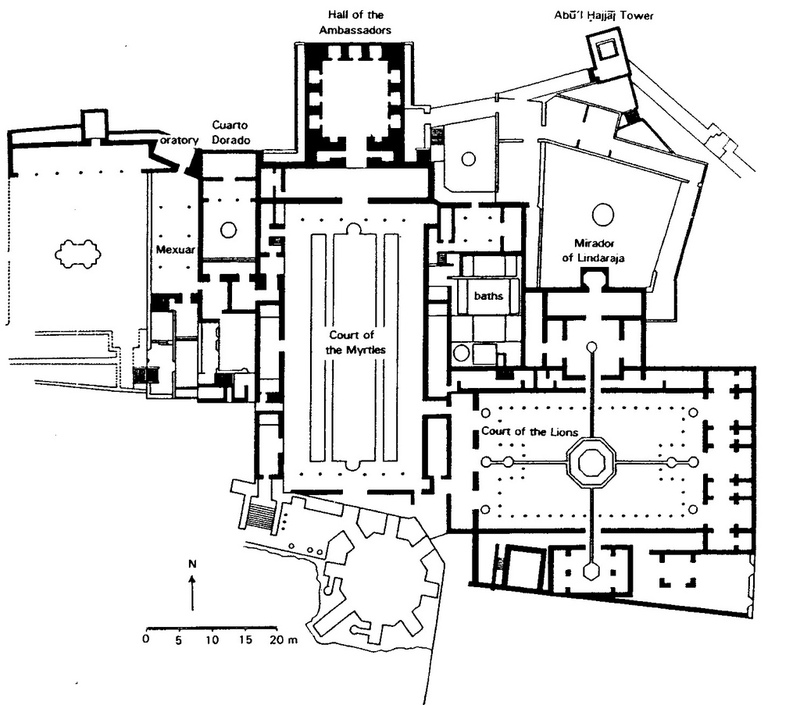 The size and complexity of the palace on Crete (see fig. 49) gave rise to the idea of a labyrinth in which multiplicity was used to confuse intruders. Model of the Palace of Minos in Knossos (Crete) in Heraklion Museum. The ancient Assyrian capital of Dour Sarkin (now Khorsabad) in northern Iraq is a much younger palace complex, but similar in scope. It was built by the ruler Sargon II between 711 – 707 BC. (fig. 716). The city walls incorporated some hundred-and-fifty-seven towers. Seven gates were richly adorned with human-headed winged bulls, similar to the older ones of Assurnasirpal II (883 – 859 BC) in Nimrud. The story of the removal of these bulls in both places (to respectively Paris, Chicago and London, see also fig. 443) recalled the unpleasant aspect of archaeological investigations drifting towards cultural theft. Fig. 716 – The palace of Sargon II in Dour Sarkin (Khorsabad), Iraq was built some twenty kilometers north of Nineveh in the years 711 – 707 BC. The terrain measured 1760 x 1635 meters and the enclosed area comprised three square kilometers of seven-hundred acres. The palace complex of the Achaemenid Persian ruler Darius I (522 – 486 BC) was some two hundred years younger than the palace of Sargon. Darius was a prolific builder, who left his marks in Persepolis, Susa, Egypt and elsewhere. Only a small portion of the palace was finished when Darius died in 486 BC. The work was continued by his son Xerxes, who ruled from 485 to 465 BC. Xerxes called his additions the Tachara Palace (Winter Palace). Many sculptures (reliefs) of wild beasts and tribute-bearing dignitaries adorned the walls. A lion frieze, dating from circa 510 B.C., is now among other treasures from Persepolis in the Louvre Museum in Paris. The ruler Artaxerxes III Ochus (c. 425 – 338 BC) added, about a century later, a Hall of Thirty-Two Columns and the Unfinished Gate to the palace complex. This king of the Achaemenid empire and the first Pharaoh of the 31st Dynasty in Egypt ruled from 358 to 338 BC. He started his reign with the murder of eighty of his relatives to secure his position. The tomb of Artaxerxes III was cut into the mountains behind Persopolis. Persepolis was eventually conquered by Alexander the Great, who looted and burned the place in 330 BC. The Palace of Xerxes was destroyed in an act of revenge for the destruction of Athens in 480 BC. Darius Palace was one of the few structures that escaped destruction. The description by the Greek author Diodorus of Sicily (in his World History, sect 17.20-22) gave the grim details of this ruthless act, committed at the end of the first quarter of the Fourth Quadrant of the Greek cultural period (see fig. 74). Fig. 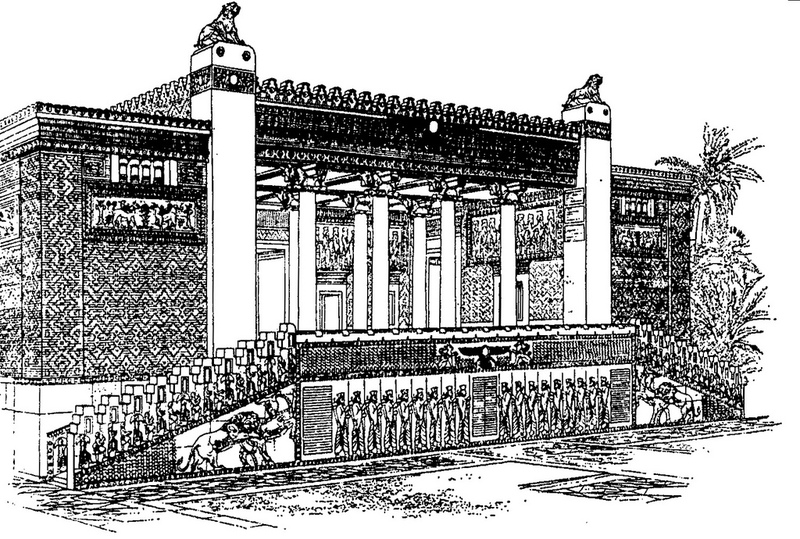 717 – A conjectural restoration of the palace of Darius as drawn by Maureen Stafford. The history of architecture, which is embedded in the history of material visibility, is full of dwellings of rulers, built in a spirit of exuberant wealth and constructed with the intention to impress their subjects. The boundaries of definition of such buildings – palaces – can be rather flexible due to the fact these places of leisure had other functions as well. The palace of Herod the Great (the Herodium) near Bethlehem, for instance, was also a fortress and will be later described in this book in Chapter 4.2.3 under the heading of citadels and castles. A good example of the complexities of functions-in-time bound together are the ‘royal’ living quarters in the That-I Sulaiman complex between Urumieh and Hamadan in the Tabriz area of western Iran (fig. 718). Fig. 718 – The That-I Sulaiman (or Takht-I-Suleiman) complex in Iran consisted of a citadel, a palace and fire temples. It is here, in the heartland of oppositional thinking, that the different quadralectic elements of a building complex come to the foreground. The wide spectrum of the symbolic meaning of the circular and the square is formulated in a structural form, which blends in with the landscape. The Takht-I-Suleiman, meaning the ‘Throne of Solomon’, was a fortified site located at a crater rim and lake with a history going back to the fifth century BC during the Achaemenid period. A citadel, palace and fire temples are joined together in this extraordinary place. The That-I Sulaiman (or Takht-I-Suleiman) complex in Iran should not be confused with locations with a similar name in Balochistan (Pakistan) and in the Sulayman Mountains near Osh, Kyrgyzstan. The solitary mountain group, just outside the latter city, has a shrine dedicated to the prophet Sulayman. The citadel had a fifteen meter high wall with thirty-eight half-round towers lying all within easy bowshot of one another. They protected the holy place, consisting of a Zoroastrian sanctuary and (three) fire temples (Naumann, 1965 in: SCHIPPMANN,1971). Two faulted gates gave access from the north and the south. Most of the present buildings were created during the (latter part of the) Sassanid period (224 – 651 AD). The first serious investigation of the ruins was carried out by H.C. Rawlinson from 8-10 November 1838, but more than hundred and fifty years had to pass before another team (of the American Institute for Iranian Art and Archaeology) showed Western interests (two days, without excavations). It was only in 1959 that the archaeologists Neumann and von der Osten, as leaders of a number (eleven) of expeditions by the Deutsche Archäologische Institut, opened up the place for scientific research and brought their knowledge to the world. Fig. 719 – This plan gives the That-I Sulaiman complex with the various functional buildings. The black lines represent the original walls, the grey lines are walls built in later periods and the white areas are recent completions. 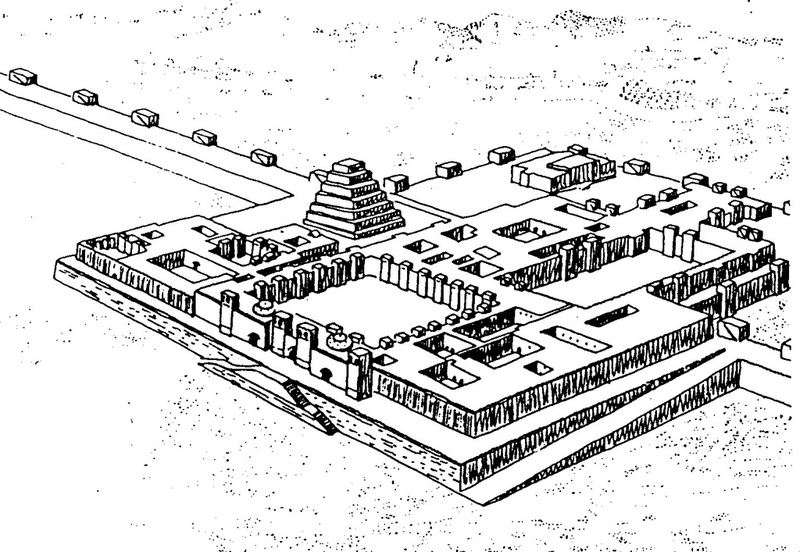 The central area A is a fire temple, just like the cross room B and the four-parted rooms C and D. The western rooms PA and PB could be the remains of the famous palace of Chosroes, but was not fully excavated. The central room A in the Takht-I-Suleiman complex has a Sassanidian fire temple in the middle (fig. 719/720). The square, domed room lies on the axis of the processional way and contained the holy fire. People could circulate in four vaulted corridors and see the fire. It was thought that the cross-room B contained the holy fire in the atasgah or ‘house of fire’ and that the room was not used for water worship, as proposed by Naumann and others. Rooms C and D (in fig. 719) were also part of the fire temple complex and were used as treasuries in which a copy of the Avesta was kept. Silver coins were found here, dating from 480 to 580 AD. The triple division of the fire temple in Takht-I-Suleiman (A – B – CD) might be a continuation of the principle of the three sacred fires called Adur Frang, Adur Gushnasp and Adur Burzin-Mehr, which were known from Parthian times (247 BC – 224 AD) and described by the Greek writers Strabo and Pausanius. A great number (234) of clay roles (or bullae) stamped with nine hundred impressions of early Sassanian seals were found in 1963 in Takht-I-Suleiman. Eighteen different bullae carrying the inscription ‘Magupat (Mobadh, meaning high priest) of the sanctuary of the fire Atur-I Gusnasp’ (the fire of the warriors) were collected. They were dated from the first quarter of the fifth century AD. (400 – 425). The idea that the legendary King Husrau I Anusirvan (531 – 578) was the first to start the cult of the fire temples in Takht-I-Suleiman is unlikely. SCHIPPMANN (1971; p. 354) stated that devotion during the reign of Bahram V (420 – 438) or even earlier cannot be excluded. Fig. 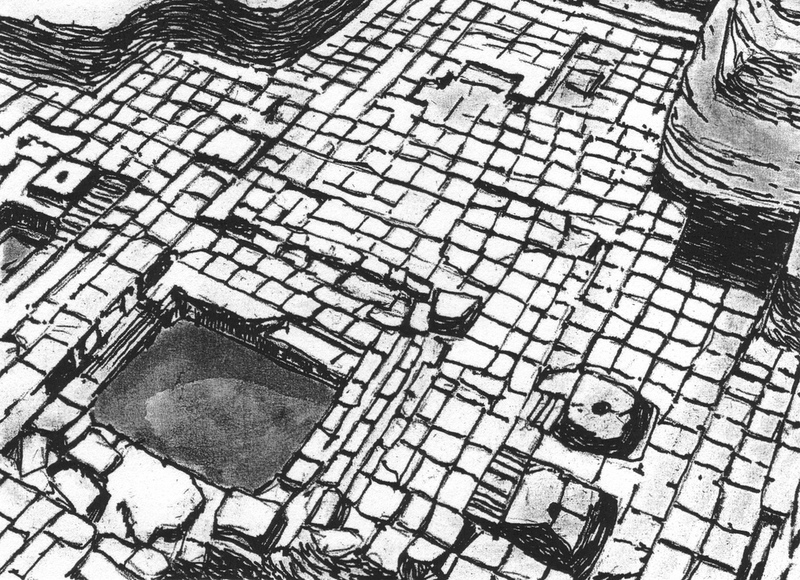 720 – Room A in the fire temple is the center of worship of the Takht-I-Suleiman complex in western Iran (drawing by Marten Kuilman). The cross room (PD) in the palace complex was designated as a palace chapel by Rudolf Naumann of the Deutsche Archäologische Institut. Two halls (PA and PB) were only partly explored and could be remains of the palace of Chosroes, according to Naumann’s report in the ‘Illustrated London News’ (16 January 1965, p. 23/24). Huff, carrying out excavations in 1966, 1968 and 1969, thinks otherwise and interpreted these rooms as being used in cult practices, with fire altars and water. He reckoned that the Yesischngah, or offering ceremonies, took place in this area during the later Zoroastrian times. The buildings of the fire-temple were finally (re)used as part of a palace in Islamitic times (11 – 13th century). The initial psychological position of a palace is, as stated before, situated in the Second Quadrant. The palace is, in contrast to other communal places of the Second and Fourth Quadrant, a personal affair, instigated by a ruler. The aspect of power brings (the idea) of a palace in the realm of the ‘Third Quadrant’. This position in a communication is concerned with numerical proportions (in design) and numbers in general. Managers like figures. The Greek philosopher Pythagoras is often quoted as the classical example of a numerical approach. 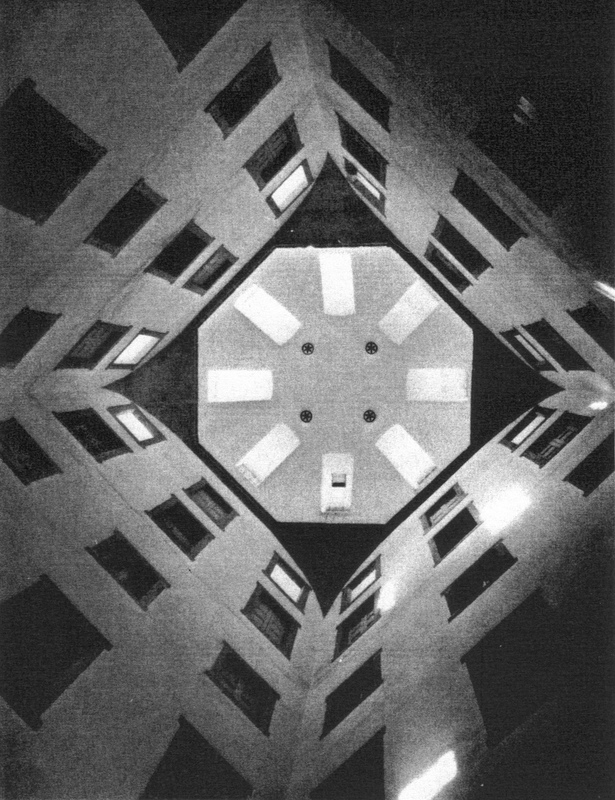 Rudolf WITTKOWER (1949) paved the way in his epoch-making book ‘Architectural Principles in the Age of Humanism’ to this particular type of architecture inspired by ‘numbers’. The history of the Imperial Palaces in the Forbidden City in Beijing (China) have been mentioned as part of the occurrence of square cities in China. 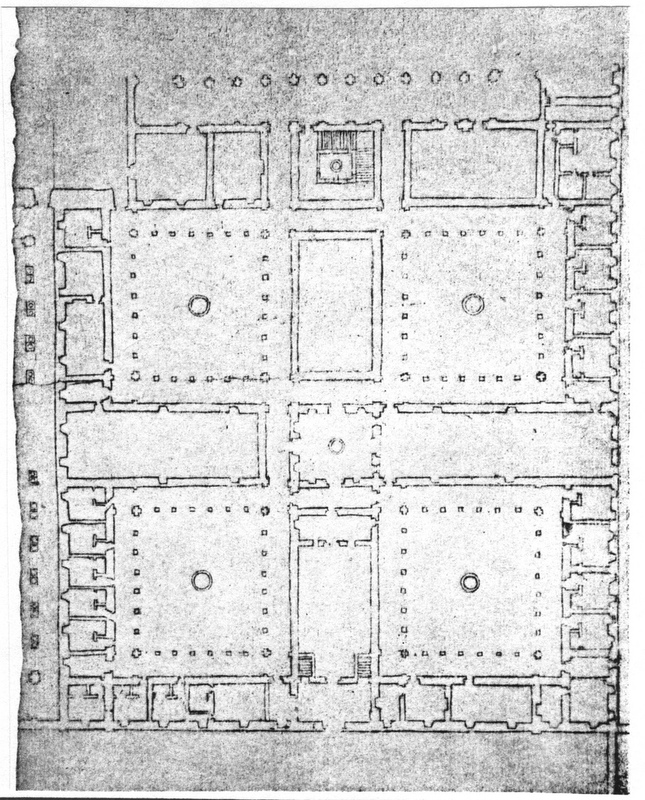 The plan of the Imperial Palace in Peking by Johann Bernard Fischer von Erlach (in his book ‘Entwurf einer Historischen Architektur’) was earlier given as figure 567. 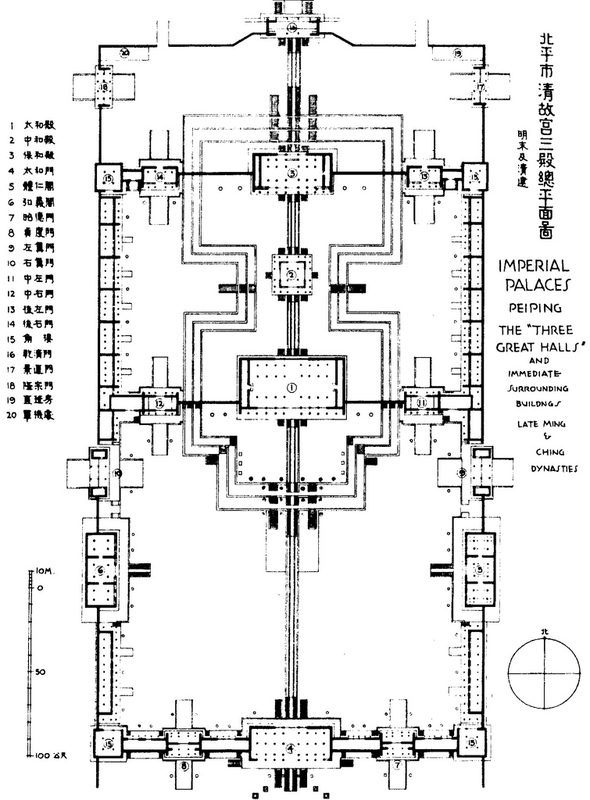 The Three Great Halls were built during the Late Ming and Ching (Qing) Dynasties (fig. 721). The third Ming emperor Zhu Di started the work in 1421. The period of his reign (1402 – 1424) was called ‘Yongle’, meaning ‘Perpetual Happiness’. The work was continued by the first emperor of the Ching (Qing) Dynasty, Shun Zhi, who ruled over China from 1644 to 1661. Fig. 721 – The symmetrical Imperial Palaces in the Forbidden City (Beijng, China) with the Three Great Halls are an important architectural complex, showing the power of the rulers. This drawing was given in the work on Chinese architecture (A Pictoral History of Chinese Architecture) by Ss-ch’eng LIANG (1984). Some palaces in the architectural history were not occupied by kings and queens, but by rich merchants, in particular in the Italian Renaissance. The Medici Palace (Palazzo Medici-Riccardi) and its rival, the Rucellai Palace (Palazzo Rucellai), both in Florence, are examples of a powerful presence, as it was derived from political and material power in the fifteenth century. The former, built in 1444 by Michellozzo and the latter, whose façade was designed by Alberti in 1446, are fortress-like buildings. They have no reference to the four-fold other than their square ground plan (10 x 10 grid). The Piccolomini Palace in Pienza (Siena Province) united a Medici-type of interior grid with the Alberti-type façade grid. The building by Bernardo Rosselino started around 1459 and is similar to the Rucellai Palace in Florence. HERSEY (1976) coined the name ‘Pythagorean Palaces’ for this particular type of civic architecture in Italy. He followed in his book the four major elements of Pythagorean mathematics: the point, line, plane and solid. The cube is seen as Procreator, the source of all numbers and form. It was, according to Hersey, the Roman writer Vitruvius, who applied an unseen, formative hypostyle (a grid of columns carrying a roof or ceiling) to Greek temples and brought in the cubices rationes (the principles of the cube) into architecture. The latter were originally the descriptive principles favored by classical poets (like the 216 lines of words forming a cube). Fig. 722 – The Strozzi Palace in Florence is a Renaissance building with the appearance of a princely palace, completed in 1538. 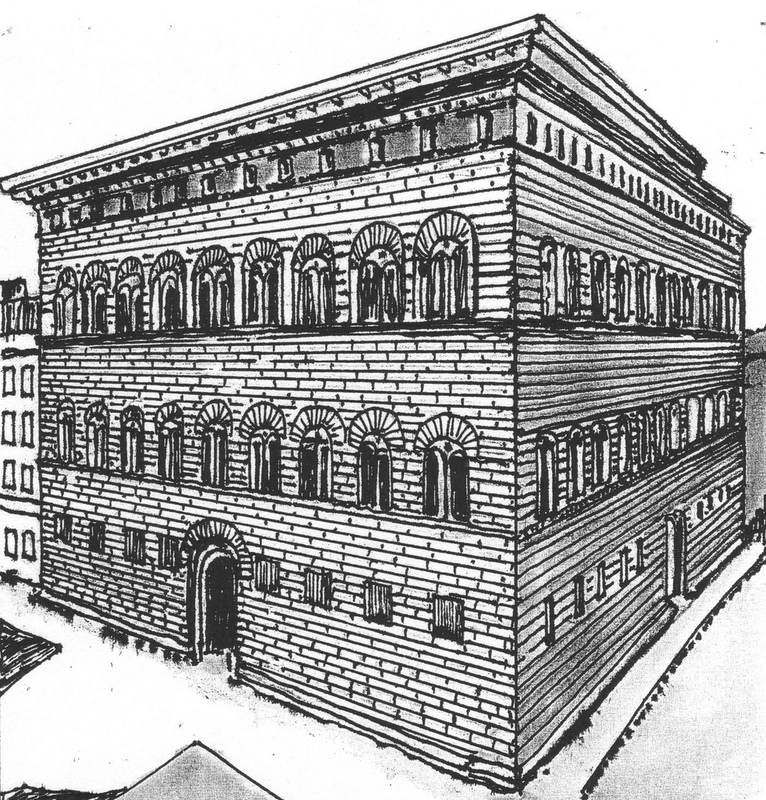 The Strozzi Palace in Florence (fig. 722) is attributed to Giuliano da Maiano and designed by Giuliano da Sangallo the Younger. The building started in 1489. The plan is an exact 4 : 3 rectangle, while the courtyard plan has a ratio of 5 : 3. There is a bilateral symmetry in the layout and the façade has a four-division. All these features together might point to a ‘Pythagorean’ design and cubic architecture in general, but this line of thought ceased with the Strozzi Palace. Other ‘master plans’ took over, based on the quincunx and various types of symmetry (other than the bilateral) were used. Maybe the Renaissance palaces should be treated as a distinct class of buildings, which are different from the historical palaces, which were occupied by real kings and queens. The sculptor, architect and theorist Francesco di Giorgio Martini (1439 – 1502) produced a number of ground plans for these civic palaces, based on a grid. He was also a military engineer involved in the building of seventy fortifications for the Duke of Urbino. The latter is known from his Studiolo in the Ducal Palace in Gubbio (see p. 520). 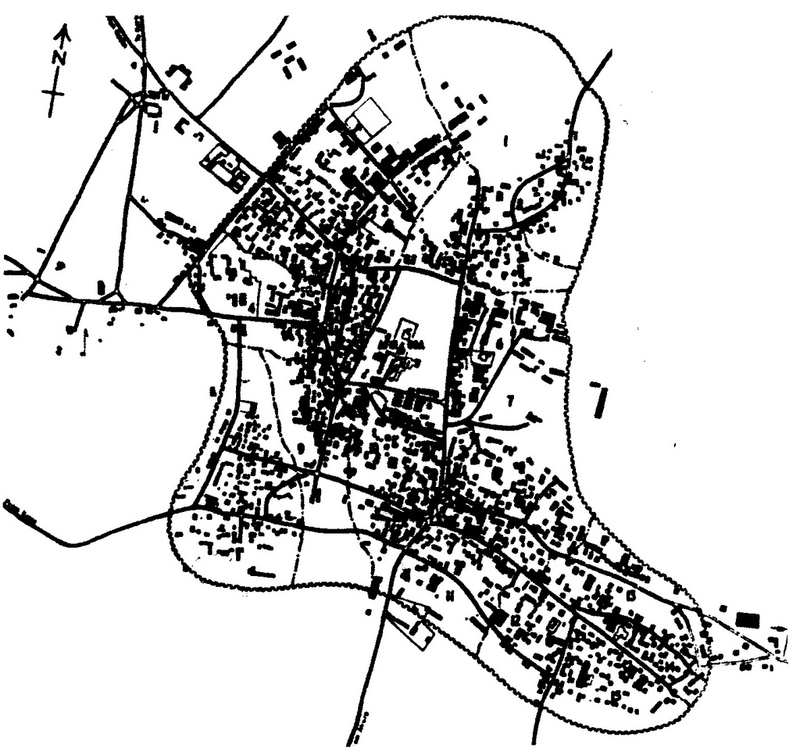 The ground plans of di Giorgio did not favor a particular number. There were grids consisting of 9 x 9, 11 x 11, 12 x 12 blocks, often with four squares, circular or octagonal cortiles (open internal courtyards). The design method offered a degree of artistic freedom within the constraints of the grid, which was generally followed in the decades to come (fig. 723). Fig. 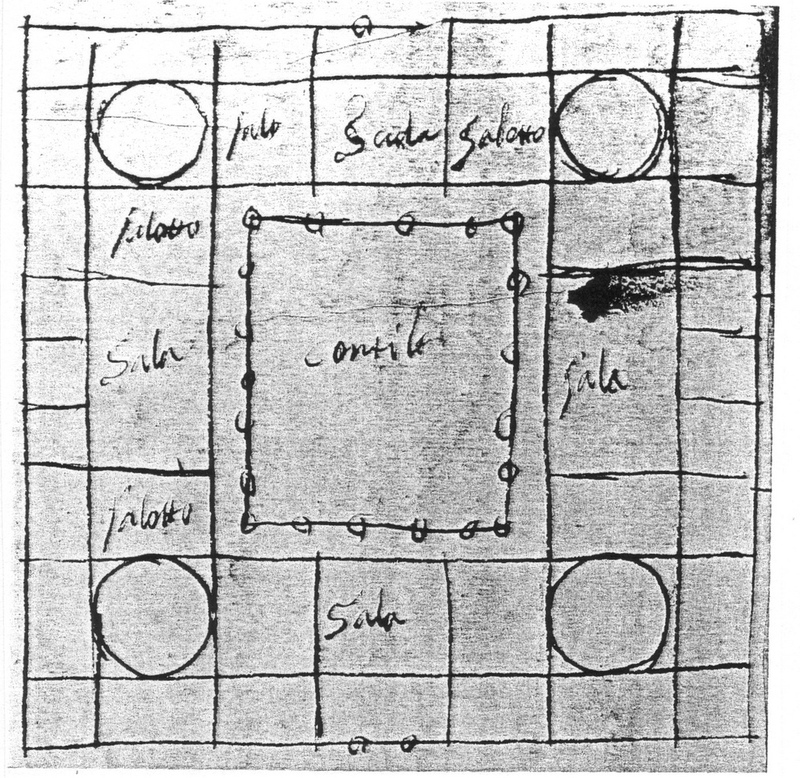 723 – A palace plan from a notebook by a follower of Francesco di Giorgio from the Codex Ashburnham App. 1828. This codex in the National Library in Paris – formerly part of Ms B (2184) and Ms A, which were stolen and sold to Lord Ashburnham, but returned to the library in 1890 – consists of an assortment of pictorial studies (including drawings from Leonardo da Vinci) and dates from around 1492. Hersey’s observations point in the right direction, but he did not make a connection with division thinking. One has to realize, that none of the great Italian ‘Pythagorean’ architects – from Vitruvius to Alberti, Filarete, Ficino (‘by far the most powerful intellect’), di Giorgio, Cesariano, Barbaro, Palladio, Serlio, Lomazzo and Scamozzi – had any clue of higher division thinking, despite their focused attention to tetradic geometry. The strict, conscious appliance of geometric and hierarchical principles in architecture points to a form of lower division thinking, even if the (numerological) four-fold is present in a prominent way. Hersey speaks of chains of binary sequences and of pairs of components. The term symmetry is in this context mainly understood in an oppositional sense. Ficino’s conclusion that buildings, through their hierarchies of design, construction and appearance, were explanatory models of human thought and of the cosmos is, nevertheless, a right one. Quadralectic architecture is also searching in a communication for the fundamental interaction between the Vitruvian signifier (quod significat) and the signified (quod significatur). The often-copied diagram of the man in the square and the circle (either the one by Leonardo da Vinci or Cesariano) are powerful Renaissance picture, who – unfortunately – send out the wrong, Pythagorean message. They depict the combination of the circular (First Quadrant) and the square (Third Quadrant) (see also p. 307, fig. 242 of this book) in relation to the ‘ideal’ human body (the human point of observation, centered in the umbilicus). The Renaissance ideal (man) is, in essence, a two-fold affair, which does not significantly contribute to the modern, quadralectic communication as a role model. The Palazzo Valmarana in Vicenza, designed by the Venetian architect Andrea Palladio (1508 – 1580), is probably the pinnacle of this line of civic palaces, which put its mark on urban architecture for ages to come. The resonance can be found in the country estates of the English nobility such as Chiswick House (see p. 516; fig. 421) of Lord Burlington, Blenheim Castle by Vanbrugh, Walpole’s Houghton Hall and Kedleston Hall by Robert Adam. These latter English country houses might qualify, just like their earlier Italian urban counterparts, as ‘palaces’ in their own right. It is a matter of definition what should be called a palace and what not, since any distinction between royalty and rich upper classes is often obliterated in their earthly mansions. The starting date of the Palazzo Valmarana is given on a foundation medal as 1566. The façade is impressive with six large Composite pilasters ‘overruling’ a minor order of Corinthian pilasters (fig. 724). The actual ‘Italian Renaissance’ was long past by that time and Andrea Palladio was just tapping resources, which were some hundred years old – and even older if the Italian and Greek sources were taken into account. However, his treatment of the classical material reached a mastership in his own right, born in the third part of the Third Quadrant (III, 3) of the European cultural history. This historical time of ‘ultra’ (visible) visibility did not leave much room for the imagination outside the constrains of duality. Fig. 724 – The Palazzo Valmarana in Vicenza (Italy) was designed by Andrea Palladio and represents a culmination of civic building inspired by classical geometrical ideas. This type of buildings became popular in the Italian Renaissance of the fifteenth century, and remained a guideline for similar constructions up to the present day. The Palazzo Valmarana can be seen as an outstanding architectural marker point of building for the rich. ‘Real’ palaces were designed and constructed in Spain at about the same time as Palladio provided the Valmarana family with shelter in Italy. The Royal Palace of the Escorial is located some forty-five kilometers northwest of Madrid (Spain) at the rim of the Guadarrama Mountains. It appears as a great stone platform carved from the mountain and its harmonizing with the landscape makes it a stonescape. It has reminiscence, according to George KUBLER (1982, p. 98), to certain Quattrocento paintings of ideal cities drawn with single-point perspective in Renaissance Italy. He gives the panel painting ‘A City Square’, attributed to Luciano de Laurana, in the Walters Art Gallery in Baltimore, as an example (see also fig. 648 top of this book). The history of the Escorial has four distinct elements, which were planned by King Philip II (1527 – 1598) after he became King of Spain in 1556: 1. The initial purpose as a place to house the tombs of the dynasty, in particular his father Charles V, who was buried in Yuste; 2. The foundation of a monastery (with hospital buildings); 3. A basilica (with a dome); 4. A palace (with a library). These four intentions, which were brought forward more or less simultaneously, have aspects of higher division thinking, but the psychological setting of the King is hard to prove. Spain was in the second half of the sixteenth century on the heights of its political power, covering the larger part of Europe when Philip II was King of Spain and Portugal, King of Naples, Duke of Milan, Ruler of the Spanish Netherlands and King consort of England (as husband of Mary I). It was furthermore, a global player in the colonial expansions across the Atlantic. King Philip II began his search for a foundation of a new monastery in 1558 – 1559. He called it San Lorenzo de la Victoria – referring to the victory in the battle of San Quintin (in northern France) on 10 August 1557, on the day of San Lorenzo. The King employed the help of the Jeronymite Order, but their suggestions and plan, where about half the size than the cuadro (block), which was laid out in April 1562 in a location near El Escorial. 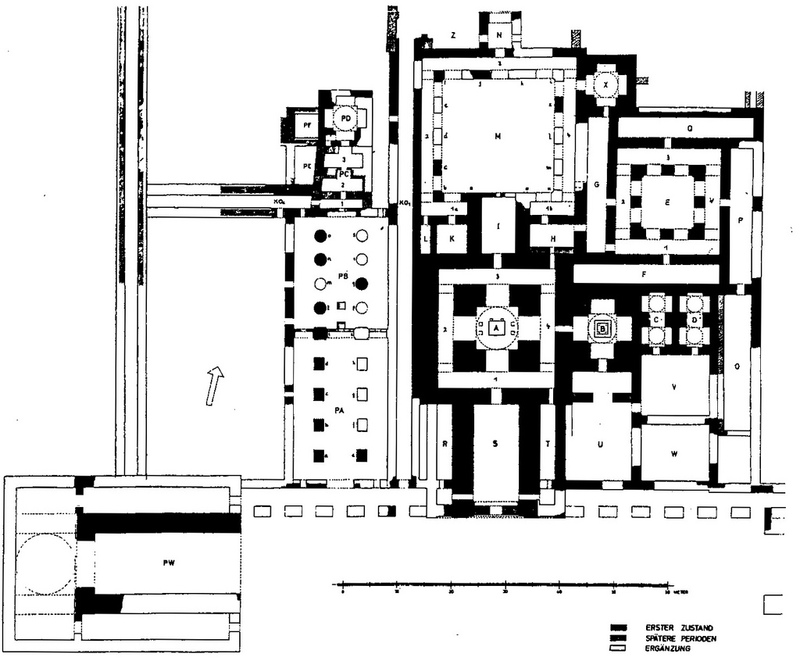 The plan of the monastery, which was first to be started, had a classical tetradic design (fig. 725). Fig. 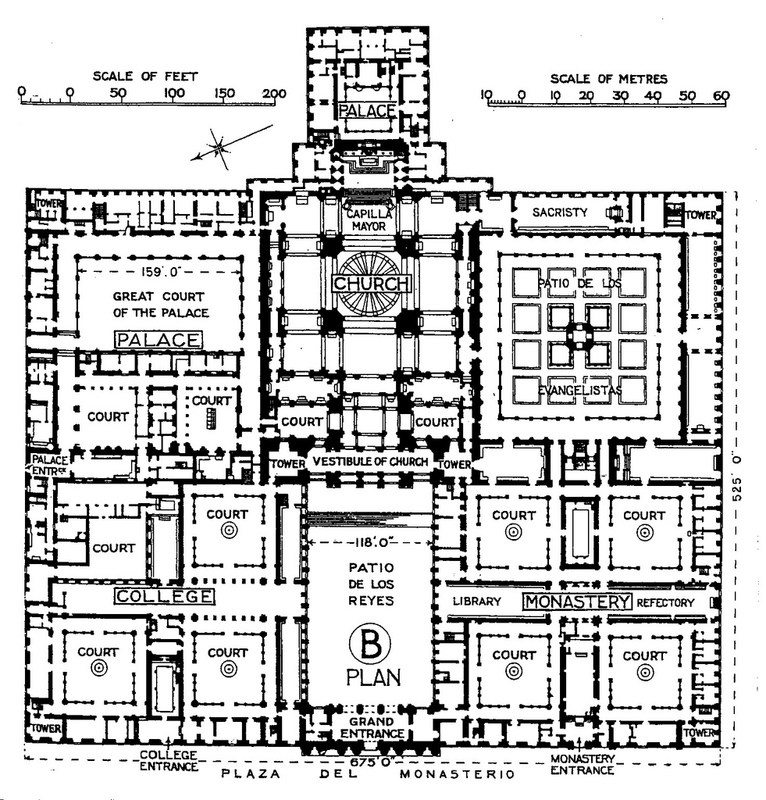 725 – The plan of the monastery cloisters (before 1567) was the first onset to the master plan consisting of the fourfold monastery-basilica-palace-library complex of the Escorial. George KUBLER (1982) mentioned three Jeronymite friars, who played a major role in the history of construction of the Scoria. Juan de San Jeronimo was present from 1562 to 1591 as the chief accountant and most authoritative as a chronicler. Antonio de Villacastin was the obrero mayor (chief workman) and Jose de Sigüenza wrote a history of the building by recording the progress of design and construction. The official work started in 1563 with the intention of Philip II to bring the body of his father Charles V, the Emperor, who died in 1558, from Yuste to the new location. Philip had an interest in building matters, which only increased after his European tour at his father’s command (1548 – 1551). The King visited England for the marriage to Queen Mary (1516 – 1558, also known as Bloody Mary, because she had three hundred religious dissenters burned at the stake) in July 1554. He was accompanied at that (political-inspired) trip by the architect and engineer Gaspar de Vega, who had to study foreign buildings and constructions, which could be useful in Spain. Vega returned overland and visited places like the Louvre, St.Germain-en-Laye and Fontainebleau. The three main architects of the Escorial were Francisco de Villalpando, Juan Bautista de Toledo and Juan de Herrera. The first named architect was originally a bronze worker, who translated Serlio. He was titled as a ‘geometer and architect’, which was the first official use of this term by a Spanish royal patron. His qualities as a humanist and theorist gained him (royal) recognition in the liberal art of architecture (KUBLER, 1982). The second, Juan Bautista de Toledo, was appointed as an architect in 1559. He had been Michelangelo’s assistant at St. Peter from 1546 to 1548. His promotion turned into a personal tragedy when his wife and two daughters and all his books and papers were lost when the ship sank, which had to bring them from Naples to Spain. His appointment – after this event and as an outsider – was marred with conflicts and crisis, but the King backed him until he died on 21 May 1567. The third, Juan de Herrera, was an assistant of Toledo, appointed by the King in 1563 to check on the unpredictable authority of Toledo. He was appointed in 1576 as royal architect – after years working in the back-ground, with close ties to the King as Master of the Horse (1569 – 1577) and later (1579) as court chamberlain. The inactive year of Toledo’s death (1567) was followed two years later by an increase in activities. Flemish slaters expanded their trade after the work on the Kings temporary dwelling La Fresneda was finished. The main staircase, which was the showpiece of the monastery, the roofing of the kitchen wing and the paving made good progress. The cloister was finished in 1579 when the parapets were placed. The basilica started in 1574 and was finished in 1586. The building of the fountain begun in 1586, following the symbolism of the Garden of Eden, with four rivers watering Asia, Africa, Europe and America (fig. 726). The design had similarities with the Fons Vitae, also with four basins, at the Manga cloister of Santa Cruz in Coimbra (Portugal), built in 1533 – 1534. Fig. 726 – The Fountain of the Evangelists, situated in the main cloister in the southeastern part of the Escorial complex. The work on the actual royal dwelling (King’s House) in the northeast quadrant had begun in 1570 – 1572. It took nearly fifteen years until the court moved from their provisional quarters to the new accommodation in August 1585, but most of the palace and the college had still to be finished. The library portico, which was part of Toledo’s ‘’universal plan’, only started when the construction of the palace, basilica and college had ceased and was finished in 1583. The hospital buildings (infirmary) were situated outside the main cuadro (of 1562) at the southwestern corner. Farm buildings, later known as La Compana, were also outside the monastery. The northern service buildings (casas de oficios) were mentioned in 1581. Fig. 727 shows the Escorial in a reconstruction of the situation in 1568. Fig. 727 – A perspective view of the Escorial as it must have looked in 1568, when most of the southern part of the complex was finished. The history of the Escorial came into a new phase after Philip died in September 1598. The complex was complete except for its initial purpose: the underground burial chamber intended for the tombs of the dynasty. 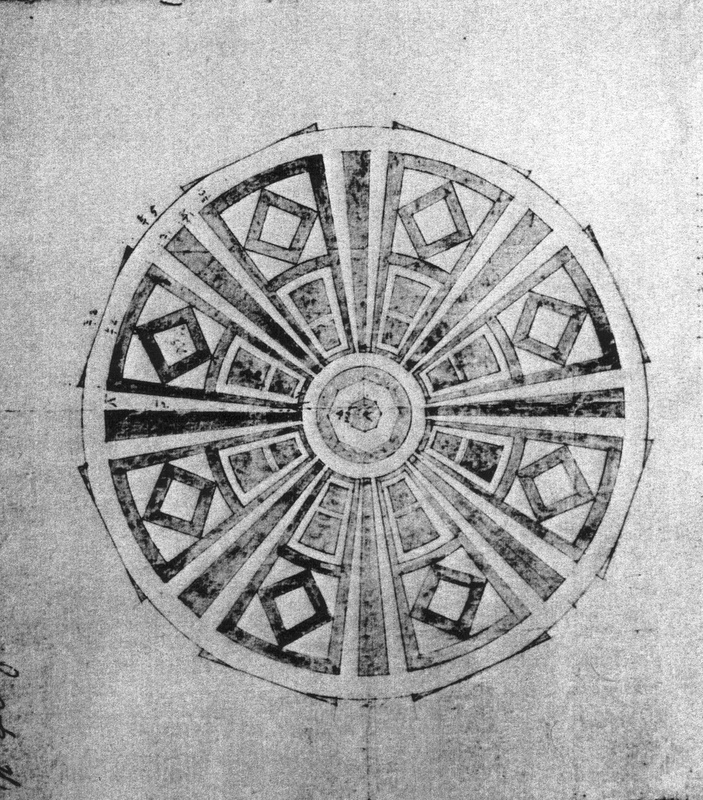 The circular plan of Panteón, initiated under Herrera’s direction, had four stairs and light shaft (fig. 728). However, little work was done until 1617 – 1635 when G.B. 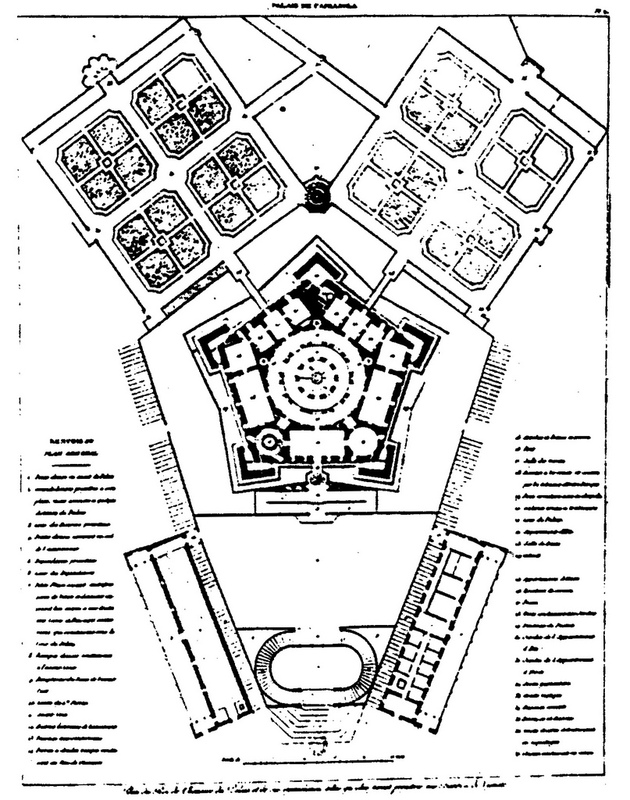 Crescenzi altered the plan from circular to octagonal. After he died in 1635 the work was completed in 1654 by Fray Nicolas de Madrid (following Crescenzi’s plan). The crypt was described by Fray Francisco de los Santos as the Panteon. His book included all the rituals of transferring the royal bodies since 1586. Fig. 728 – The original circular scheme of the crypt by Herrera was called the Panteón and intended to be a burial chamber for the tombs of the dynasty. Several fires caused damage to the complex in later years. The first one happened in 1577 at the southwest tower. A most destructive fire took place on the 7th of June 1671, in which also the monastery roofs burst into flames. Many manuscripts were destroyed. Some sixty years later, in 1731, the fire started again at a chimney in the college. The Compana was destroyed in 1744, and the last great fires took place in 1763 and 1825. A plague of termites threatened the building in 1953. This event sparked a restoration program instigated by the government. The crossing towers in the monastery and college were rebuilt in 1963. Their spires were re-designed by Bartolomé Zúmbigo in 1673 in a Baroque fashion, but changed again to the original layout of Herrera as given in the last quarter of the sixteenth century. The result was an example of the use of two of the major elements of a quadralectic architecture: the octagonal roof fitted onto the square of the tower (fig. 729). Fig. 729 – The interior of the monastery-crossing tower of the Escorial – as it was restored in 1963 according to Herrera’s original plan – has two of the characteristics of quadralectic architecture. 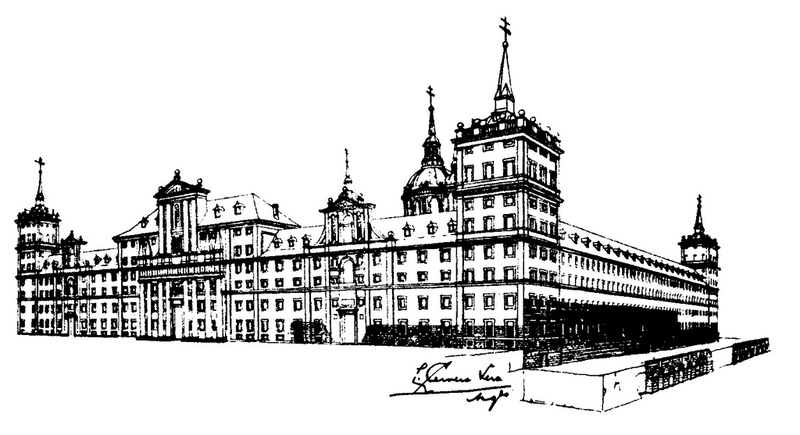 A characterization of the Escorial complex by art historians (like Nikolaus Pevsner) pointed to a classification as a ‘mannerist’ building (fig. 730). Mannerism is the term (from maniera) used for an imitation and exaggeration of the work of the High Renaissance. Its severity and simplicity were associated in the first half of the twentieth century (mainly by German art historians) with puritanism and asceticism, like the character of Philip II himself. This perception was later challenged and even denied: ‘If psychic states and architectural forms were this closely related in the process of design, then architecture as a whole would long ago have been recognized as a dictionary of psychic attitudes’ (KUBLER, 1982; p. 126). Fig. 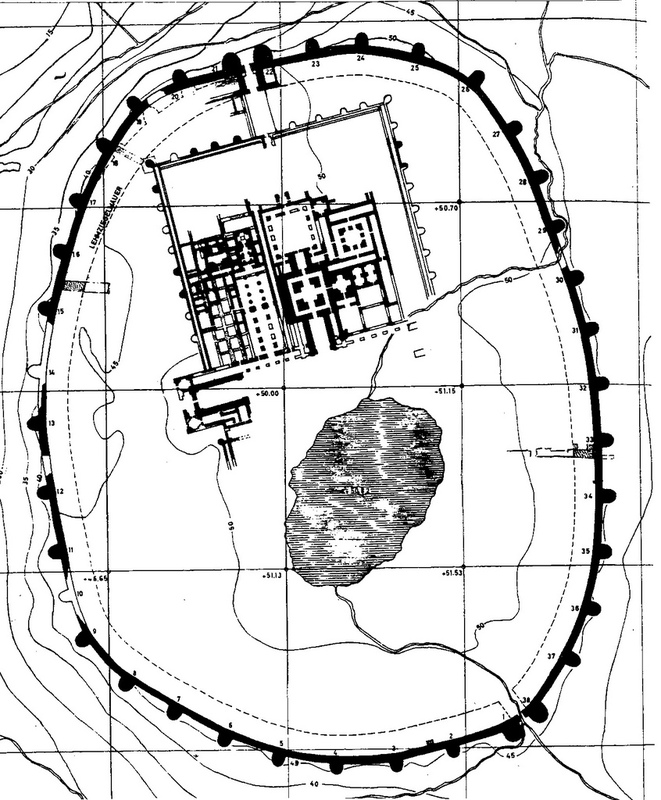 730 – The plan of the Escorial near Madrid follows tetradic lines with a four-division in function (palace, college, monastery and place of contemplation) organized around a church with a square ground plan. George Kubler (pp. 128 – 130) denied the view that the King and Herrera had occult views. He could prove that the King did not sympathize with astrology and horoscopes. The court’s association with the mystic Ramon Lull (1232 – 1316) – the ‘Doctor illuminatus’ with his combinatorial method for categorizing all possible knowledge (see p. 780), but also with his intention to convert Muslims to Christianity – was purely academically, according to Kubler. It is regrettable that none of these authors make any reference to a particular type of division thinking, which might elucidate such labels like Mannerism, Puritanism, astrology, magic, etc. Another building in Spain with a proud history is the Fortress Palace of the Alhambra in Granada. The complex begun by the founder of the Nasrid dynasty around 1250 AD and can be seen as the final bastion of Spanish Islam (fig. 731). The further construction was spread over a period of two hundred and fifty years. The palace of Charles V, started in 1526, is situated at the southwest of the Court of the Lions. It is an octagonal-circular building, designed by Pedro Machuca, a pupil of Michelangelo. Fig. 731 – A plan of the Fortress Palace of the Alhambra, situated on a hill above Granada (Spain). The palace of Charles V (1500 – 1558) can be seen as the star-like feature at the lower center, south of the Court of the Myrtles. The Alhambra is a storehouse of Islamic motifs in which the tetradic signs feature prominent. The Court of the Lions is a masterpiece of garden layout with the octagonal fountain with twelve marble lions in the middle. There seem to be a direct influence of the Patio de las Doncellas in Sevilla, but its roots are in the Persian ‘Charbagh’, the division of the court in four parts, representing the four parts of the world. The irrigation channels symbolize the four rivers of Paradise. The palace of King Louis XIV (1638 – 1715) of France at Versailles is probable the prototype of what a palace should look like (in Europe). Louis XIV commissioned his architect Le Vau (1612 – 1670) and his landscape architect André Le Nôtre (1630 – 1700) to extend the hunting castle of his father Louis XIII and improve the adjacent grounds (fig. 732). Fig. 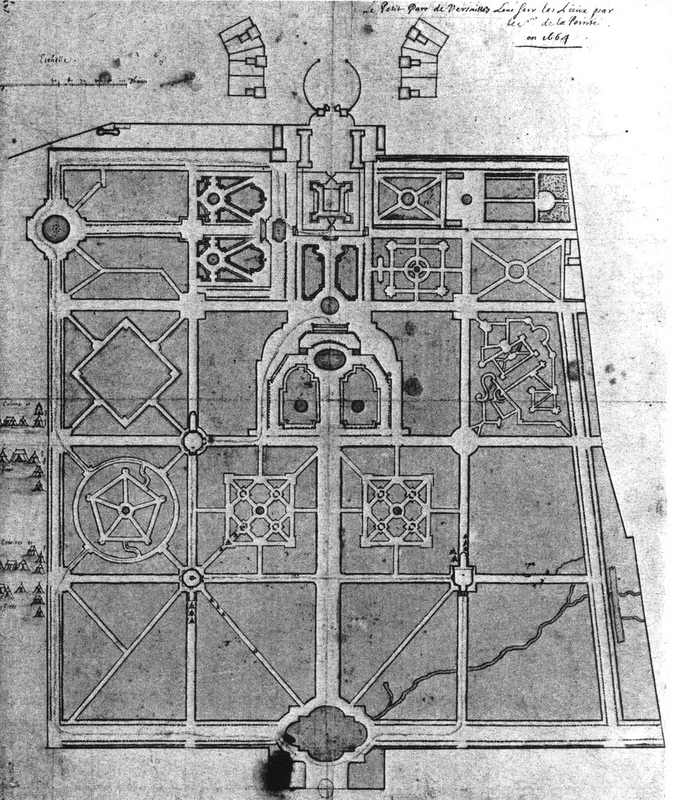 732 – The map of Le Petit Parc de Versailles by F. de La Pointe was dated 1664, when the work of the Petit Château (1662) and the first Orangerie (1663) was finished. The dating of ca. 1668, as suggested by Robert Berger (1985), is difficult to explain since many buildings had reached different forms than given on this map. The Sun King (le Roi Soleil) moved his court to Versailles in May 1682 while the architect Jules Hardouin-Mansart continued the improvements of the palace. The painter Charles Le Brun (1619 – 1690) did the interior decorations of the new additions and collaborated in the landscaping of the palace gardens (THOMPSON, 2006). The royal tapestry suites of the Four Elements and the Four Seasons (1664 – 1668) were after designs by Charles Le Brun. The iconography of the Versailles palace was a particular concern for the Petite Académie, a consulting group of literary men like Charles Perrault and Jean Chapelain. They first met in February 1663. The building program got soon thereafter a dynamic leader in the person of Jean-Baptiste Colbert (1619 – 1683), who replaced Ratabon as Superintendent of the King’s Buildings in January 1664 (BERGER, 1985). The last (fourth) building campaign (1699 – 1710) concentrated on the construction of the royal chapel and the apartments of the King (STUMBERG EDMUNDS, 2002). Fig. 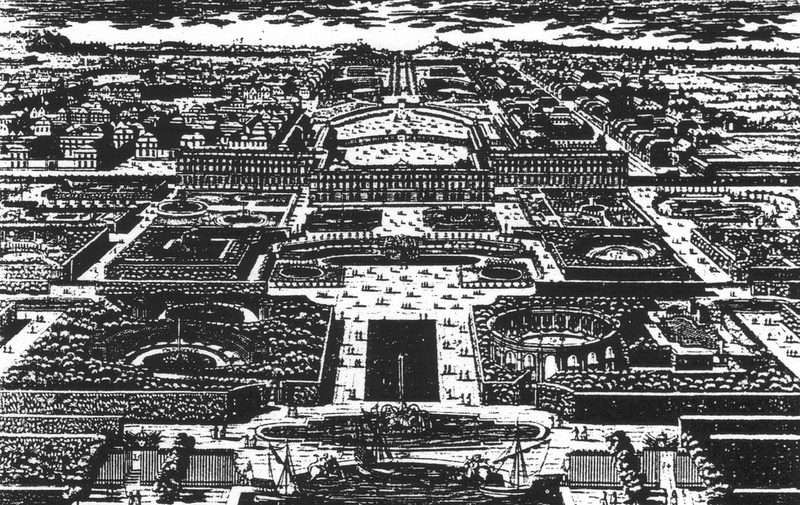 733 – The buildings and gardens of the palace of the Sun King Louis XIV of France at Versailles, west of Paris, indicate a symmetry along a central axis. 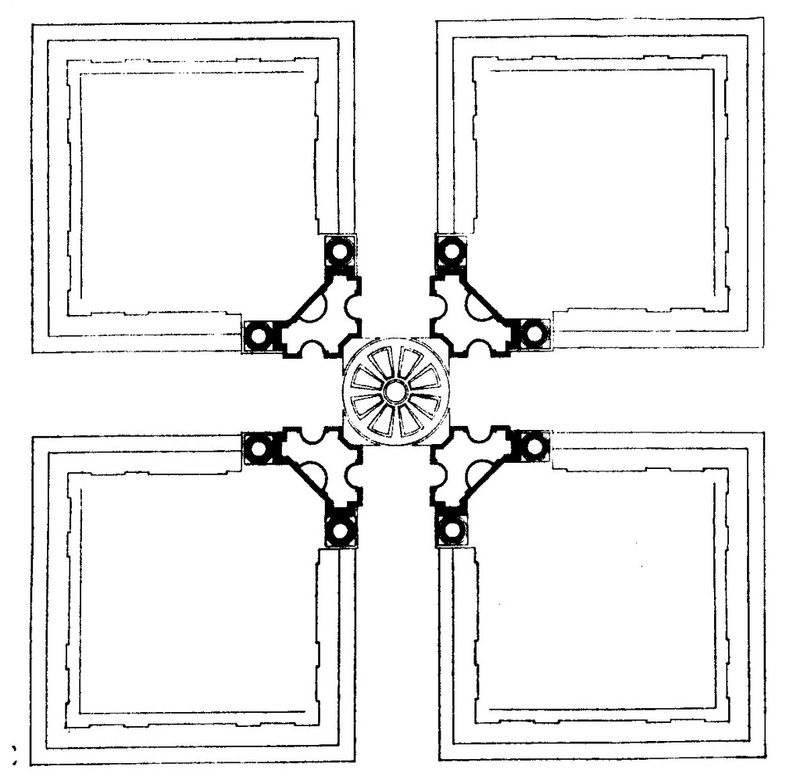 The formal axial layout (E-W) of the palace gardens (fig. 733) is associated with linear thinking. The palace, with an exuberance of art objects, is dedicated to empirical visibility into the extreme. This objective is achieved either by unity (Latona Fountain), dualistic themes, like the ‘Fountain de la Victoire d’Apollon sur le Serpent Python’ or by the (numerological) fourfold, like Apollo’s chariot in the Apollo Fountain (by Jean Baptiste Tuby). The story of Bernini’s equestrian statue of Louis XIV is memorable as an illustration of the volatile mixture of power and art. The statue was made by the celebrated Italian sculptor Gian Lorenzo Bernini (1598 – 1680) for a public square in Paris, but was regarded so repulsive that it ended up as the Roman hero Marcus Curtius in Versailles. The marble of Louis XIV Equestrian was carved by students from the French Academy in Rome under Bernini’s guidance between 1671 and 1677. Bernini died in 1680 and Colbert in 1683, and the statue was still in Rome. Eventually, it reached Paris in March 1685, when the artistic judgment turned sour, and the marble was placed in the Orangerie of Versailles Palace. The King ordered it destruction, but in stead the French sculptor François Girardon got the task to change the statue to that of a Roman hero, Marcus Curtius. The story went that a seer declared in 362 BC that the Romans had to throw their most valuable possessions into a chasm, which had opened up in front of the Forum. Then Curtius, a youth of noble family, jumped in fully armed and the chasm immediately closed again. The spot was afterwards covered by a marsh called the Lacus Curtius. The Versailles Palace can be seen in the wider setting of its historical significance as the apex of materialism in Europe. Its position in the fourth part of the Third Quadrant (III, 4) of the European cultural period (see fig. 267) fits into a characterization of this period as a ‘Golden Age’ – but also as a period of struggle and turmoil. The cultural entity of Europe had passed its Second Visibility Crisis (SVC, 1650), with its realization of the shortcomings of material wealth, and reached soon thereafter in the Sun King of France the physical proof of its emotional poverty. The Royal Palace of Caserta was, some fifty years later, Italy’s answer to the glamour of Versailles (fig. 734/735). It surpassed the former in size and was probably the largest building erected in the eighteenth century in Europe. The Reggia di Caserta, thirty kilometers north of Naples, had twelve hundred rooms. The Bourbon King Charles VII of Naples laid the foundation stone on 20 January 1752 after he had seen a scale model by the architect Luigi Vanvitelli (1700 – 1773). This architect and engineer had drawn and supervised the pentagonal Lazzaretto (hospital) project in Ascona between 1733 – 1738 (see p. 430, fig. 346). Luigi Vanvitelli was the son of the Dutch view painter Gaspar van Wittel (1653 – 1736), who made a name in Italy with his topographical views known in Italy as vedute. Fig. 734 – The Palace of Caserta and projected extensions as part of an etching by Luigi Vanvitelli (1756). The tetradic outlay of the palace is a conspicuous feature, echoed in the different garden designs around the central building. The history of the palace and its gardens cover a long period from the sixteenth century, when it started as the property of the noble Caetani family of Sermonti, to its culmination in the nineteenth century when the palace’s throne room was finished in 1847. The palace consisted of an entrance hall divided into three aisles and opened on its sides on four courtyards. The spacious, octagonal vestibule seemed to be inspired by the Basilica di Santa Maria della Salute in Venice. The latter, in turn, paid tribute to Byzantine designs such as the Basilica of San Vitale. The ‘Rooms of the Seasons’ were painted by Antonio de Dominici and Fedele Fischetti with colorful allegories of the tetradic theme of the Four Seasons. The palatine chapel is often compared to the similar royal chapel at Versailles, which was designed by Robert de Cotte (1656 – 1735). The gardens were completed after Charles VII left the Kingdom of Naples for Spain and became Charles III, King of Spain. His son, Ferdinand IV of Naples, together with the son of Luigi, Carlo Vanvitelli, continued the further extensions of the building. Lord Hamilton, an envoy to the Neapolitan court, persuaded Queen Maria Carolina (of Austria and Regina di Napoli e di Sicilia, 1752 – 1814) to compete with her sister Marie Antoinette of France, who enjoyed the gardens of the Petit Trianon at Versailles. Maria Carolina employed the English botanist Andrew Graefer, who was famous for his gardens. The ‘Botanical Garden of the Royal House’ started in 1782 and featured, besides the avenues and the Bath of Venus, two statues of a Sphinx and a Shepherd playing the flute. These statues were previously owned by the Caetani family, the founders of Caserta. Fig. 735 – The Royal Palace of Caserta (near Naples) was the megalomanic answer of the Bourbon Kings to the palace in Versailles. 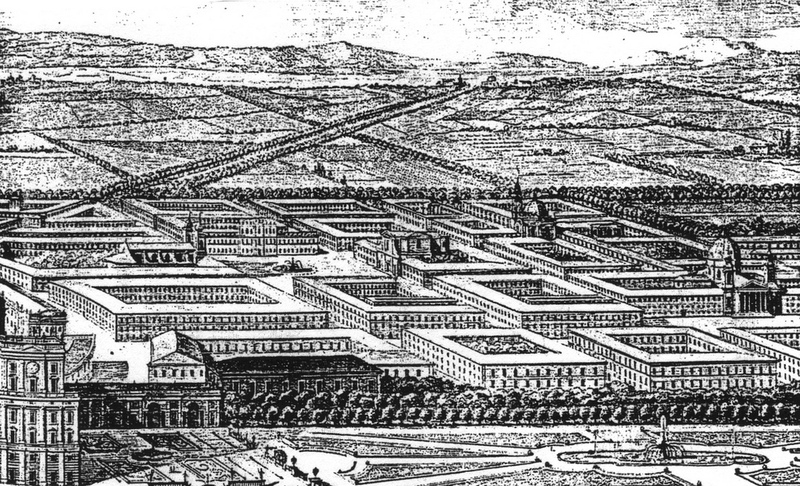 The Royal Palace of Madrid by Filippo Juvarra and the Charlottenburg near Berlin might have acted as models, but this city-palace – as planned by Vanvitelli – exceeded the other palaces in cheer size. However, the outlay as given on this etching (of 1756) never substantiated in this way. The Palace Farnese at Caprarola, some sixteen kilometers from Viterbo, is another famous palace in Italy. It is more than two hundred years older than the Palace of Caserta and was built by the architect Giacomo Barozzi da Vignola (1507 – 1573), known as Vignola. The pentagonal building should not be confused with the Palace Farnese in Rome, one of the great Renaissance ‘Pythagorean Palaces’ designed by Antonio da Sangallo the Younger (1484 – 1546). 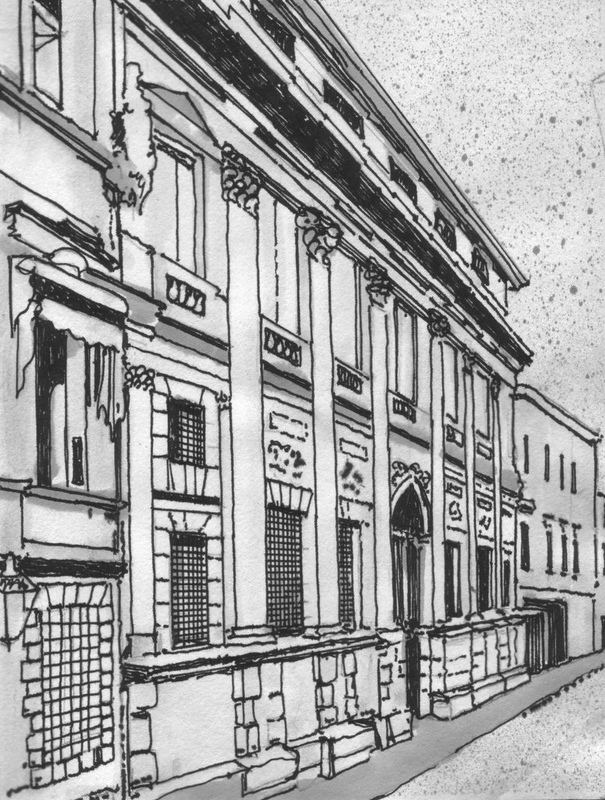 The ‘palace’ in Rome started in 1515 and was again some fifty years older than Vignola’s efforts in Caprarola (1559 – 1564). The Italian architects of the later sixteenth century gathered by that time the courage to go beyond the constraints of opposition. Fig. 736 – The Palace Farnese at Caprarola has a pentagon shape and a circular internal courtyard, pushing Renaissance geometric ideas to its limits at the final stages of its presence. A pentagon fort was transformed by the architect Giacomo Barozzi da Vignola (1507 – 1573), known as Vignola, into a summer residence for the Farnese family in the years 1559 – 1564. Many other palaces can be mentioned throughout Europe, in particular those built in the exuberant Barock (1600 – 1720) and Rococo (1720 – 1770) periods, but the space of this book is limited. The history and setting of palaces, like the Winter Palace in St. Petersburg (Russia, created in the 1750s as the winter residence of the Russian tsars and their families), Charlottenburg Palace in Berlin and Sans-Souci Palace in Potsdam (Germany), the summer retreat of the Habsburg dynasty known as Schönbrunn Palace in Vienna (Austria) and Buckingham Palace in London (England) are glorious buildings in their own right. They are the eye-catching signs of visibility in the Third Quadrant of the European cultural history. Palaces – as a common political and social focal point – are widespread over the world and found their practical application in most cultures. Just to mention a few, like the Japan’s Imperial Palace in Tokyo on the grounds of the ancient Edo Castle, the Potala Palace in Lhasa (Tibet), which was built in 1645 on Marpo Ri Hill, or the royal residence of the Maharaja of Jaipur known as the Rambagh Palace in Jaipur (India), gives no justice to many other great palaces elsewhere. Exuberance is often the word to characterize the dwellings of kings and queens – which puts the phenomenon (of palace building) in the realm of the Fourth Quadrant of a quadralectic communication. The emphasis on the material-many can be the reason that most palaces are lost in the multiplicity of possibilities without a deepening of impressions other than those of power. 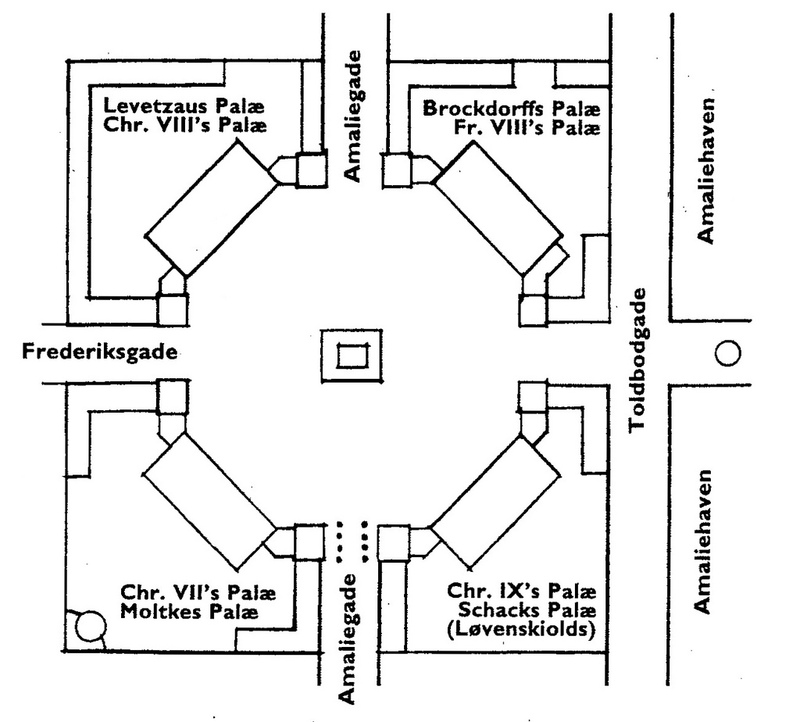 The palace complex in the Amaliegade district in Copenhagen (Denmark) might be an exception. 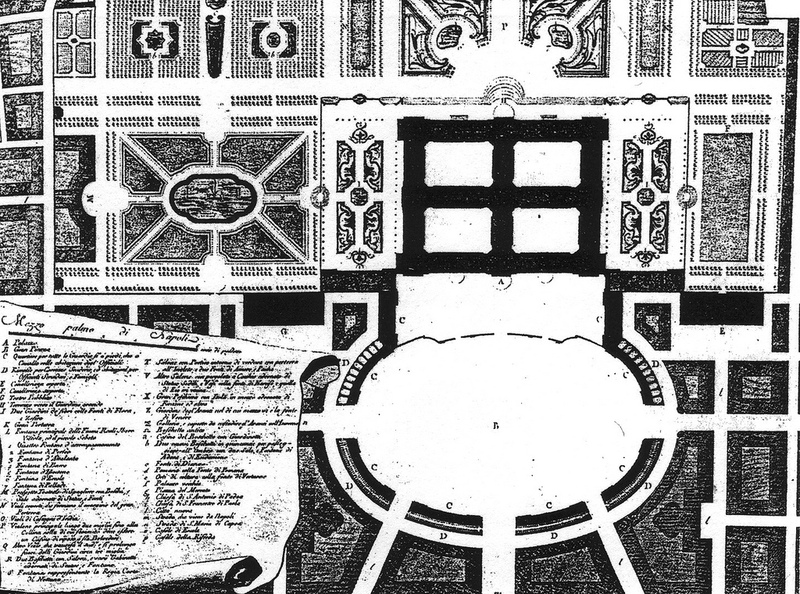 The Danish gardener and architect Nicolai (Niels) Eigtved (1701 – 1754) drew up a plan of four Amalienborg Palaces, which form an integrated composition and carry the spirit of a tetradic setting to its ultimate form (fig. 737). Two of the four Amalienborg palaces were com-pleted before Eigtved died in 1754. The work was continued by another leading Danish architect and historian, Lauritz de Thurah (1706 – 1759), and completed in 1760. Fig. 737 – The four palaces at Amalienborg, Copenhagen (Denmark) are designed by the architect Nicolai Eigtved (1701 – 1754) in the last years of his life. They are a hallmark of a tetradic approach to architectural design. The palaces of the Yoruba people, living in present day Nigeria and Benin, underline the psychological setting of royal buildings within a society. The Yoruba people are known for their violent history, which is well-studied, because their history is closely intertwined with the slave trade of the nineteenth century (ADE AJAYI & SMITH, 1964; SMITH, 1969). 1. Oyo type, found in the Oyo major kingdom. 4. Egba kingdom type, originating only in recent times (after 1830). Ake, the palace of Alake, who was the foremost Oba (king) of the Egbas, is an example. The Yoruba palaces were relatively large edifices. ‘The traditional and spi-ritual eminence of the Oni of Ife evoked a spirit of willingness on the part of the people to serve him without hesitation ensured the largeness of his Afin’ (OJO, 1966; p. 26). Relatively stable kingdoms had large palaces. Fig. 738 – The arrangement of quarters and individual buildings in relation to the Afin (royal palace) in Ado-Ekiti, a city in southwest Nigeria, in the state of Ekiti. The Afin Oba is situated in the square area in the center of the city. The surrounding town wall has no particular geometrical shape. Ado-Ekiti, in eastern Yoruba land, shows the central position of the Afin Oba with the quarters around it (fig. 738). The palace (afin) is always close to the market and had a direct relation with the trade, which took place in the center of town. The marketplace of Ado-Ekiti was even enclosed by the palace wall until the early part of the previous century. The Afin Olowo at Owo was removed from the geometric center of the town, but the built up part facing the main market is near the middle of the town. The palace is more or less rectangular, with multiple compounds. Originally there must have been over one hundred courtyards of which only seventeen are still intact. The Afin Oyo in Oyo-Ile had a triangular shape and has a very complex layout, with separate temples (Temple of All-Purposes-Deity, Temple of Sango and Temple of Orisafunfun) and the quarters of the princes and princesses to the south. The apartments of the slaves were on the eastern side of the palace grounds. The surrounding earthen wall had seventeen gates (fig. 739). The Afin Ake in Abeokuta (meaning ‘under the rocks’), a place in south west Nigeria in the Egba province of Yoruba country, had relative few courtyards. Their initial length was determined by two stone throws of the first Alake (Sagbua Okukenu). Fig. 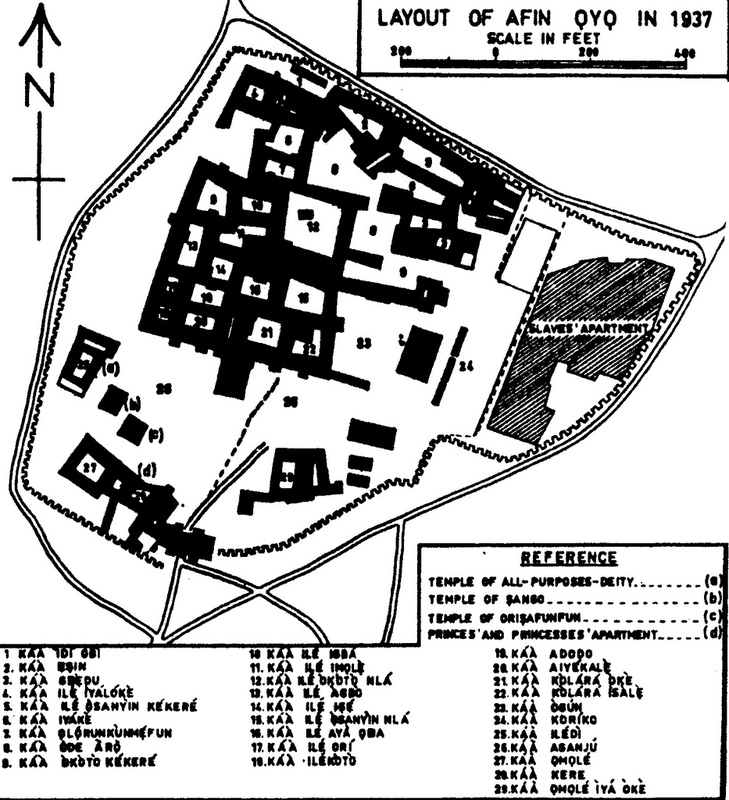 739 – A map of the Afin Oyo (Oyo Palace) in 1937 indicated three temples and apartments for the princes, princesses and slaves. No particular geometrical form was followed in the lay-out. Large walls, made of mud, characterized the general architectural style of the Afins. These protective measures shielded the ‘divine’ rulers from the townspeople. Some holes were made in the wall to allow the king to observe the people outside, in particular during festivals. Only one gate was made towards the direction of the market, but also some secret gates allowed the Oba (king) to leave his palace secretly. The kobi or porch is a typical feature, like the projection of a veranda into the courtyard. The kobi is an architectural mark of rank, only for the houses of the Oba. Elaborately carved doors were another feature. Mud sculptures were a part of the palace architecture, symbolizing human beings, and animals like elephant, lion, leopards and snakes, pointing to the power and wisdom of the Obas. A left-hand door panel with birds and a divination tray (fig. 740) was originally designed for the entryway of an Ifa meeting-house or for the court yard within a Yoruba palace. Fig. 740 – A door panel of a Yoruba palace with a divination tray. The sculptor, Olowe of Ise (c. 1873 – c. 1938), was a master craftsman, who also created architectural sculptures at the palaces of Akure, Ikere, Ise and Owo. The square divination tray in the centre was used by the Ifa priests to guide the king through his difficult decisions. A zigzag serpent occupies the space between the curved border sections of the square. The snakes serve as messengers between the human and the spiritual world. The Ifa (divination) board-as-a-whole is a means to convey divine wisdom of the god Esu (or Elegba) in a communication with humans. Its function could be compared to the CF-graph in the quadralectic world view, which is also a visible tool to pinpoint a position in a communication. The two pairs of twelve ‘birds of Ifa’ are part of the iconographic aspects associated with divination. A row of four birds is turned towards the square in the middle, while two rows of four face each other and are ready to fly away. The birds represent nocturnal powers of women, who acted as witches. The snakes, on the other hand, symbolize positive feminine qualities of patience and coolness. The animals move between two worlds: the birds between land and air and the snakes between land and water, symbolizing the cross-cross between matter and spirit. Modern changes and contact with Western culture have changed a great deal, and the afins (palaces) have dwindled in size and importance. The towns expanded and many afins have disappeared altogether. The market often moved to larger spaces and does no longer need the support of the royal palace. The forest backgrounds of many of the old palaces are mostly gone, used for firewood and farming. Corrugated iron sheets replaced thatched roofs. The afin ceased to be the pivot of activities, and its functions were taken over by churches, mosques and town halls and other social institutions. A curious development in architecture towards the end of the nineteenth century was the idea and subsequent building of a ‘Peace Palace’ in The Hague (Holland). The fin de siècle showed a frantic activity in all fields of human endeavor. The idea of world peace had caught on with diplomats, military men, jurists and politicians alike. They gathered from all over the world in The Hague in May 1899 in the so-called ‘Hague Convention’. The idea of a Palace started from a discussion in 1900 between a Russian diplomat, Friedrich (Fedor) Martens and the American Andrew White over the location of a Permanent Court of Arbitration. The Scottish-born steel baron and philanthropist Andrew Carnegie (1835 – 1919) was first prepared to donate a library, and later paid some 1.5 million to the project. An international competition was held to choose a suitable design. Some of the greater architects of the day were passed over, like the presentation of the Finnish architect Eliel Saarinen (1873 – 1950) (fig. 741). Fig. 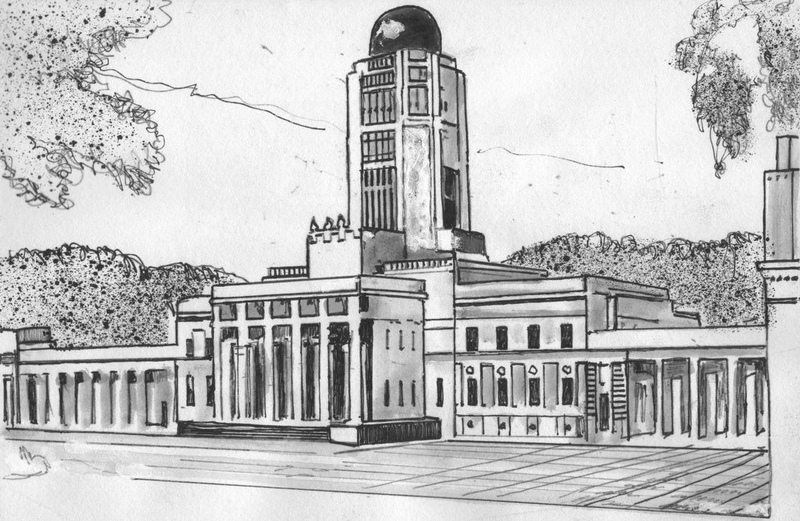 741 – This design for a Peace Palace (Vredespaleis) by the Finnish architect Eliel Saarinen (1873 – 1950) was not chosen at the Design Contest for the Vredespaleis in 1905 (drawing by Marten Kuilman after a photo). The typical timepieces of the Dutch architects Berlage and Kromhout were also rejected in favor of an eclectic design by the French architect Louis Marie Cordonnier (1854 – 1940). He made his name with the municipality building of Dunquerque and the Opera and Chamber of Commerce of Lille in northern France. His own house, called Villa Wilhelmine, was built in Hardelot, twelve kilometers south of Boulogne-sur-Mer. The architect J.A.G. van der Steur later simplified and sobered down the fashionable hotchpotch design. Van der Steur (1865 – 1945) designed some ten villas in Bloemendaal and seventy-five objects in Haarlem (Holland). His style was saturated with neogothic elements, with references to the English land house style. In 1907 the first stone of the Peace Palace was symbolically placed during the Second Hague Conference. The inauguration ceremony took place on 28 August 1913, one year for the outbreak of the First World War. Some seventy million soldiers were mobilized in this war and more than fifteen million people were killed, putting the idealistic efforts in The Hague in perspective. Recently, a painting of Gerard de Lairesse, called ‘Triumph of Peace‘ – depicted a scantly dressed lady falling from the air – was restored by Ingeborg de Jongh and Milkoden den Leeuw. The different designs of ‘Peace Palaces’ is the apotheosis of a ‘Victorian Architecture’, which blossomed in the nineteenth century. One of its main characteristic was the absence of ‘style’, as was pointed out by the art critic John Ruskin (SUMMERSON, 1970). The railway buildings, city offices and warehouses had a feel of eclecticism and massality. Fig. 742 – This design for the Palace of Westminster by Charles Barry (c. 1836) indicate the basic elements of Victorian architecture. Architects like Butterfield, Street, Scott and Seddon need a fresh appraisal. The critical tone on their involvements with Gothic Revival, established as a canonical truth in the early twentieth century, might change in the light of a modern, quadralectic approach. 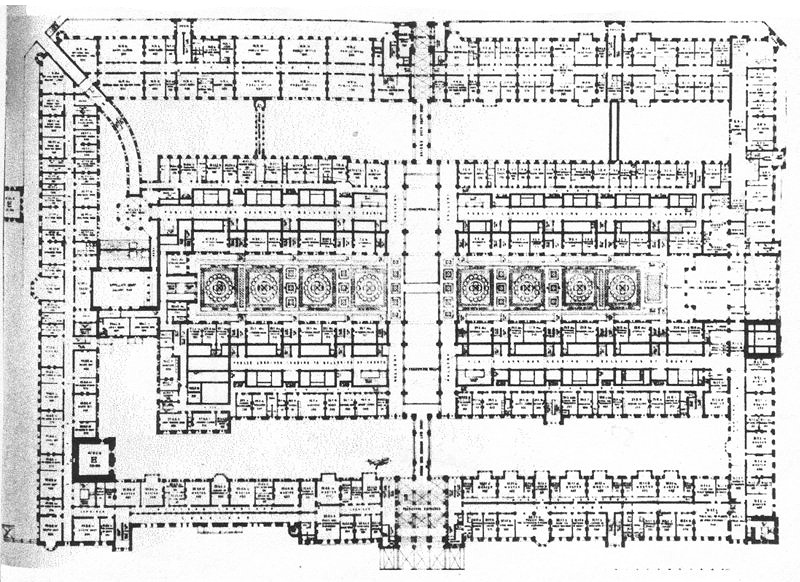 The design of the Palace of Westminster by Charles Barry (fig. 742) and the works of the Law Courts Competition of 1866 (fig. 743) are representatives of a ‘Fourth Quadrant’ style, which should be understood in the appropriate context. Fig. 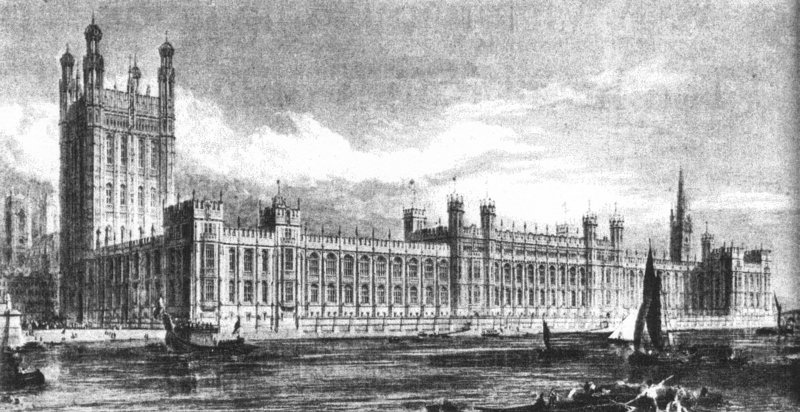 743 – This plan for the Law Courts Competition of 1866 was given by the English architect A. Waterhouse.